THNX, I have done it this way! 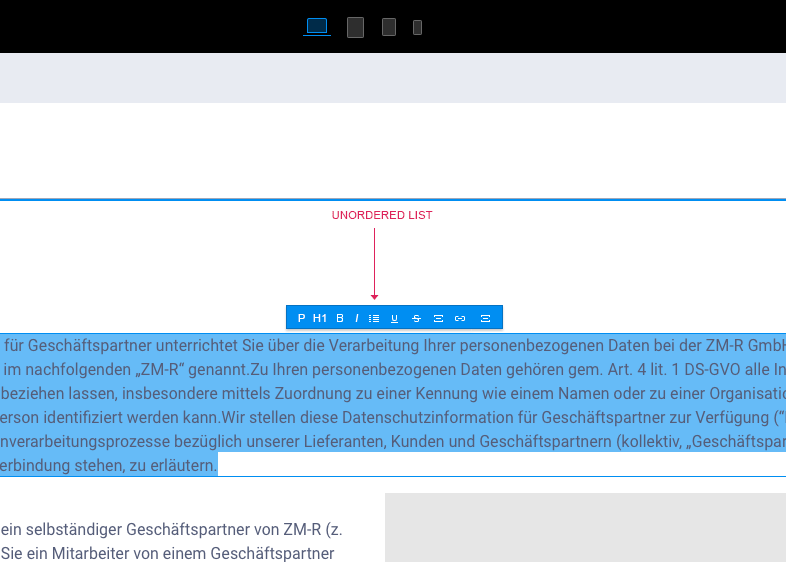 You could give a classname to the paragraph(s) and edit them with the classmanager (type, color, size etc). Can you change the bullet points to dashes? One way (shown at right) is to make separate small paragraph brics for each line, and insert the bullet you like as a text item at the front of each. As for the second option ( on your post Right side) adding a bullet to the first character doesn’t stop the overflow lines from aligning with the bullet and not the actual text. Here’s an animated .gif showing how I put the bullet in. I have the bullet in my favorite list, but you’d need to do a search for one (like the “black circle” I mentioned). All I do in the animation is place my cursor where I want the bullet and then double click on the emoji – then it inserts. I agree with you that if you have bullet text long enough to wrap back this may not be the best way. The point of my post was that the emoji was superior to using a dash. I’ve also attached the .bloc project. there is a shortcut for bullets: e.g. (german keyboard layout): alt+shift+ü. Test it on your keyboard. i am sure you find the shortcut for your layout. for non QUERTZ keyboards alt+shift+9 will also work. Thanks But isn’t this getting away from the OP request to align the text part when lines break to a new line. Also my secondary query was changing the default list character to something other than the bullet. BTW option 8 always adds a bullet character on a Mac. A trick to make bullets is to use a background image for the bullet (left-aligned), and then use padding to move the text to the right of the bullet. Norm, I am trying to make a list of notes appear at the bottom of a site. Following your advice, I now have a List and within that list I have added Paragraphs to each list item – which is a real pain because I have 26 list items! Anyway, when I click on “List” in the left sidebar and then look at the right sidebar, I see Appearance > Style and bullets. That’s nice and much better than using emoji bullets like other suggested because you get the proper INDENT for each line (i.e., I may have several lines for each bullet point). But the problem is, I don’t want bullets. I want a NUMBERED LIST. I can do this in Freeway very easily. And while I could manually type in “1.” and “2.” and so on, I would lose the INDENT. In other words, all the text should be left aligned and the “1.” should be further to the left than that. It’s the same when you choose a bulleted list. The bullets shoot off to the left of the text, as they should, and all lines of text for each bullet point is beautifully left-aligned. So how do I get numbered lists in Blocs? Adding the Code Widget bric is the only solution I can find, and it’s certainly NOT a lovely solution, let me tell you. It would be nice if I could just choose bulleted lists or numbered lists in the right sidebar. Freeway lets me do that rather easily. Regarding the amount just set up one and then select the li in the tree and duplicate it with duplicate keyboard shortcut. No way to do numbered lists. I’ll see if I can get that added. Hi! What is the best way to create a number list i Blocs? MDS, yes I saw your code in the other thread. And I understand how to modify the code. But what I was trying to say was that it is EASIER to edit text in a WYSIWYG way, inline on the page. If Norm can add numbered lists to the right sidebar in the future, that would be the ideal fix here. Okay. Maybe then it would be better to request it under the wish list category instead. However, I see @Norm has already replied and hopefully you’ll have this in a future update. I hope we get “normal” ordered & unordered lists soon. The so-called “Blocs structure list” is cool, but I really need a no-fuss way of writing plain old lists in text. Please make it easy like TinyMCE, CKeditor, Word, etc. so any idea so that the font does not change?